Don’t let having kids stop you from living an adventurous lifestyle. Happy Easter! Hopefully one full of adventure! One thing I will never regret is having kids. 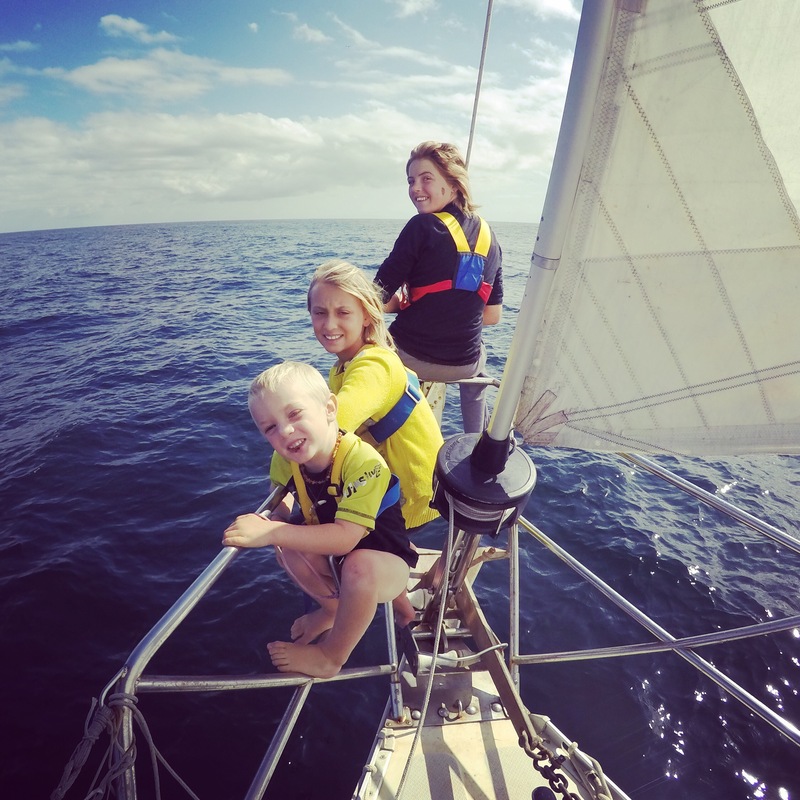 We are a sailing family of 5 living on a 40 foot monohull. Both my husband, Christian and I come from adventurous lifestyles which do not include having children for many people. 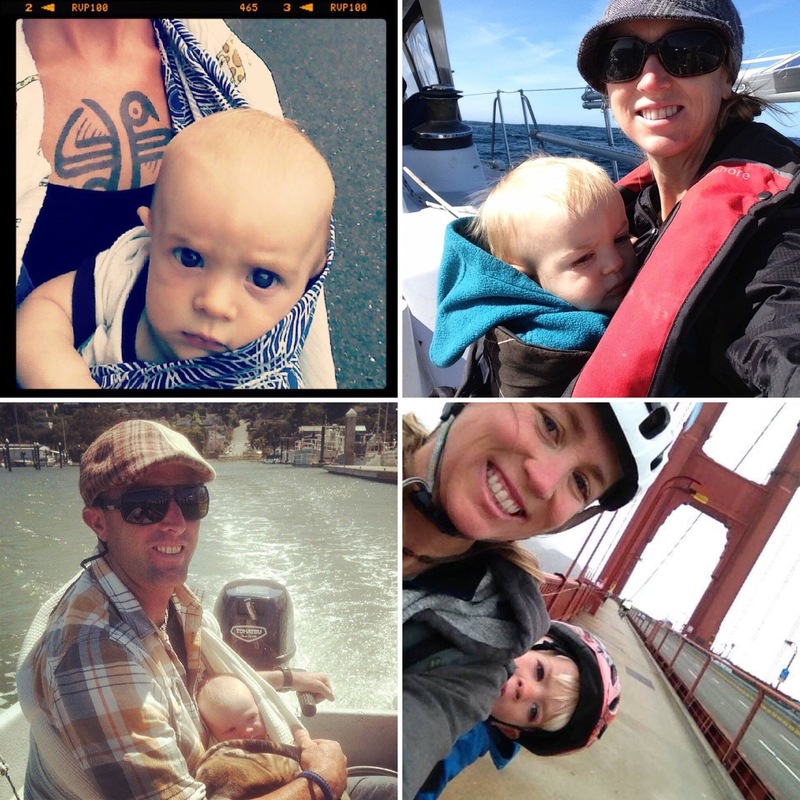 From the very beginning, we decided to not let having kids get in the way of living an adventurous lifetime together. 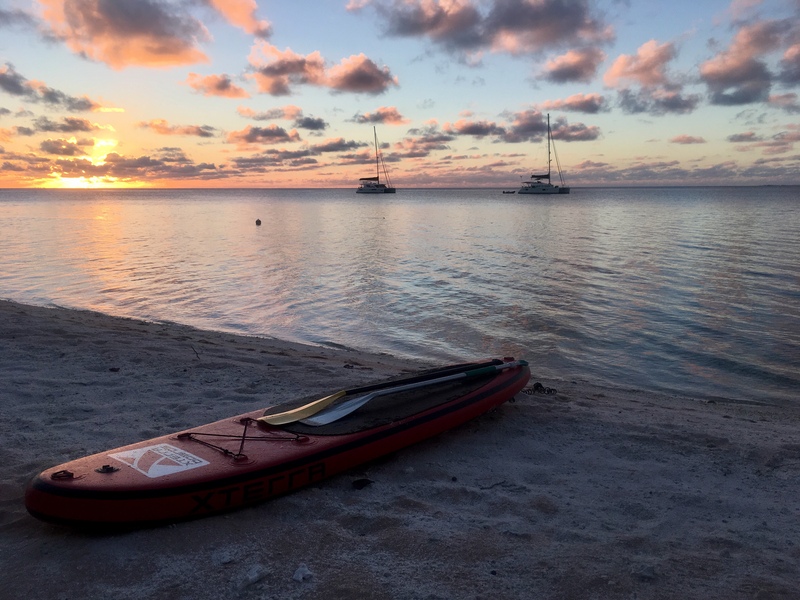 Sure, there was an adjustment period, some things are harder and more limited, but with the desire, patience, the right safety tools, good gear, and amazing friends, we are able to still live life to its fullest… well, almost. First and foremost all you need is the desire to continue living a life full of adventure. I realize this make look different for everyone. For some it may include skydiving, base jumping, climbing the 10 highest peaks in the world. For others, adventure might be a few camping trips a year. 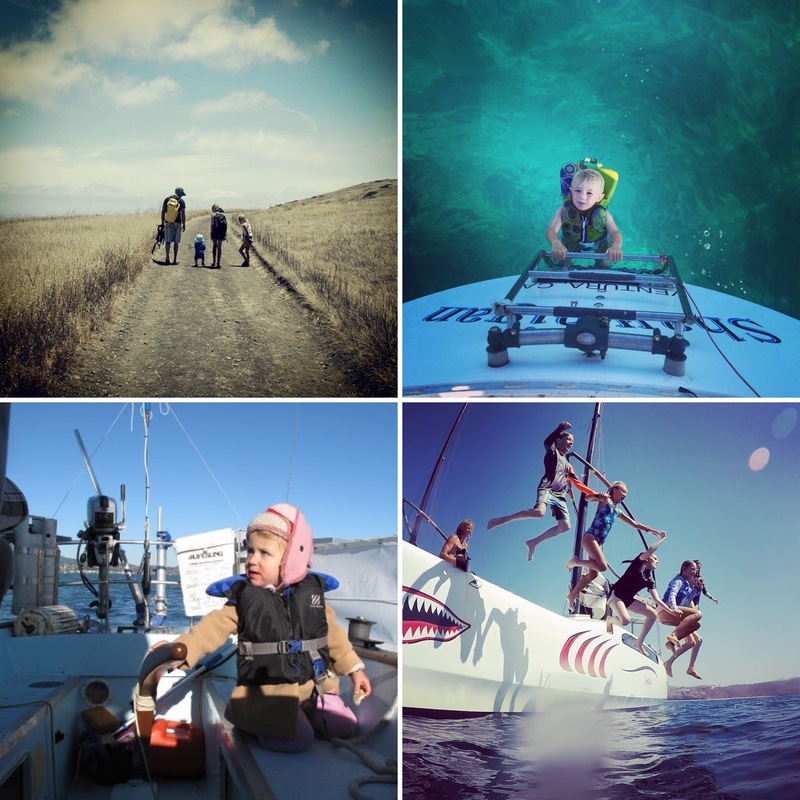 For us adventure is surfing, swimming, yoga, biking, hiking, camping, road trips, and SAILING THE WORLD! The biggest change with having kids is the thought process that “life is not about just you anymore”. So, for those skydivers and base jumpers, the fact that you have a little one that depends on you may alter your adventurous activities a little more than the weekend camper type adventurer. Keep on having fun, be open to finding a new balance. Having a child teaches patience and a level of selflessness. No longer can you do things on a whim, for the majority of the time. Selfishness turns to selflessness. That doesn’t mean you need to let that stop you from doing what you want. You just have to work on planning better and creating the opportunity to allow for what you want to do to happen. For example; add an extra 30 minutes to all of your departure times. It’s amazing how much time packing a few extra diapers, extra clothes, food, etc., will take. It goes without fail that your child(ren) will have to go to the bathroom right as your walking out the door to go somewhere. Your previously 5 hour road trip will now be 6 – 7 hours with the added necessary breaks. Just expect it and make the best out of it. Our road trips are more fun when we relax and take our time. Make it a point to slow down and enjoy it. Adventure doesn’t mean rushed. 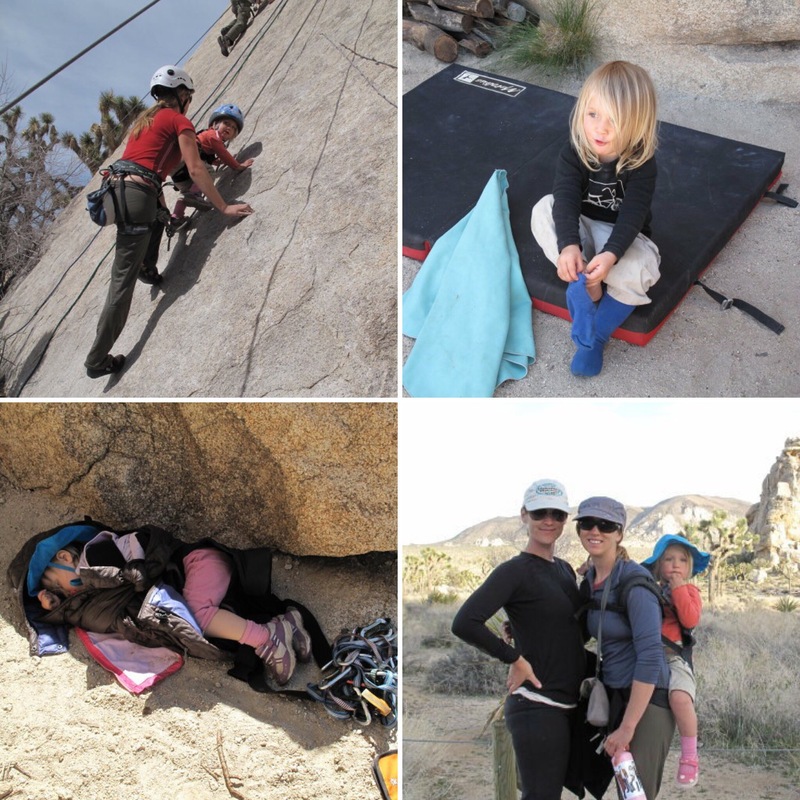 I took Ellamae rock climbing in Joshua Tree when she was 2. I timed some climbs during nap time, had her join me for a climb and friends helped watch. Make sure you have the right safety tools suited for yourself, partner, and children for the adventure your on. Maybe even have spares available for taking you child’s friend along. Safety for the child usually comes as second nature, but not always. 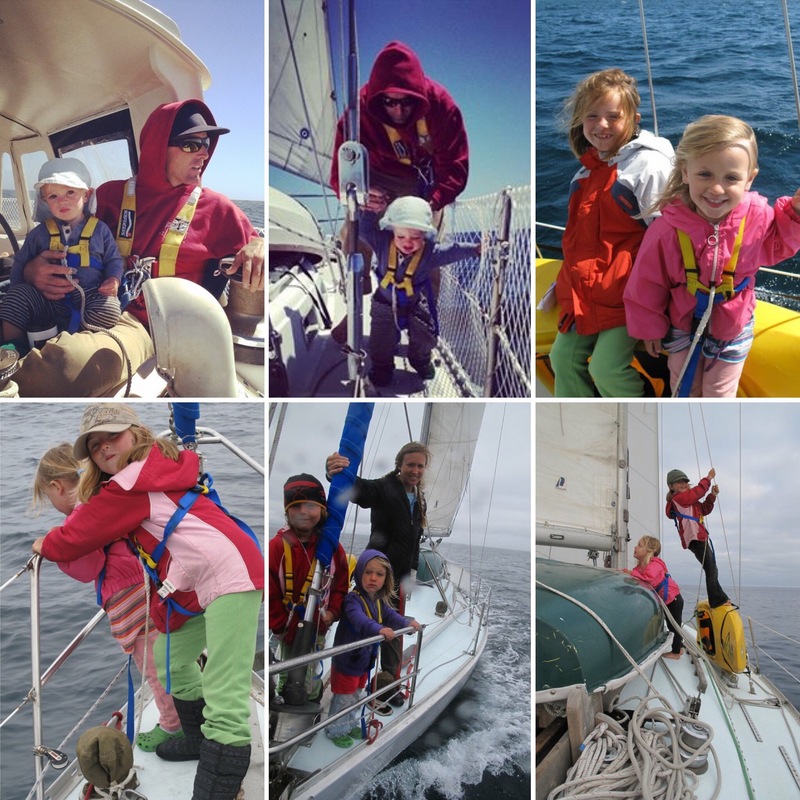 For us, a major concern is keeping the kids from falling in the water while sailing. 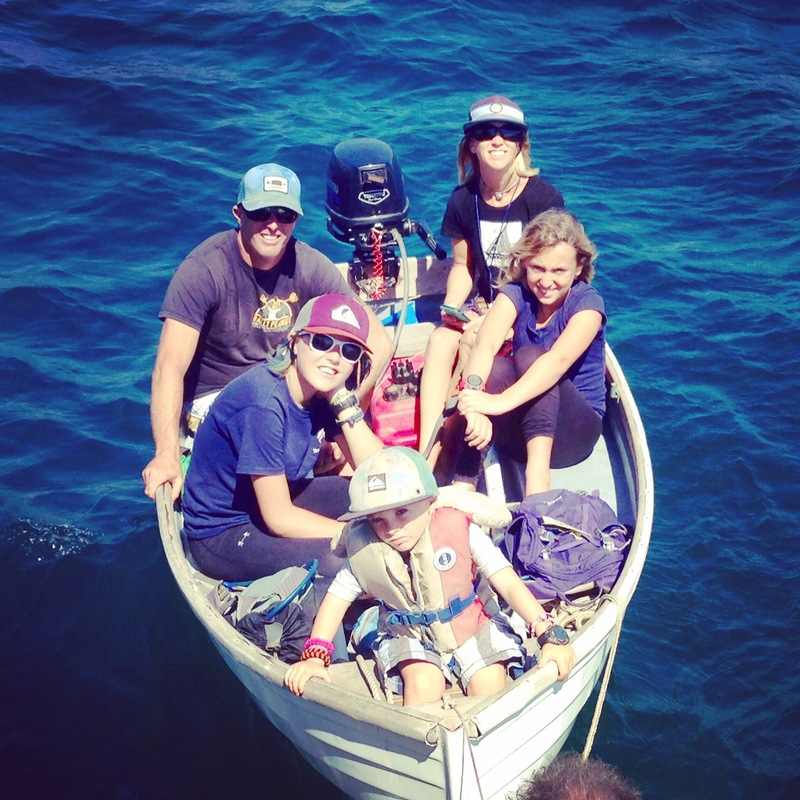 We ALWAYS have them in harnesses and tethered if they go out on deck when we are sailing offshore. Don’t forget about yourself! Remember my comment earlier about “it’s no longer just about you anymore!”? Well, it’s true, so you may wanna up the ante on safety. Going rock climbing? Wear a helmet. Sure you might look silly, but better silly and climbing than having your kid grow up seeing you in a long term facility with a brain injury, or worse, growing up without you. I know that’s extreme, but it gets the point across. Obviously the same goes for riding bikes, skiing, etc. Use your best judgement here. When sailing offshore, both Christian and I wear our life harnesses as well. Especially when we are on watch at night. We wouldn’t want to lose anyone at sea. My biggest fear is waking up and not seeing Christian on deck or watching one of our 3 children fall overboard in rough seas and knowing that it would be next to impossible to find them, so we prevent that from happening in the first place. Safety looks a little different for everyone. Living life has risks that are par for the course. If you lock yourself and family up in a bubble you may stay safe from most of life’s perils, but you probably won’t be living the adventure you sought for. Don’t let fear stop you. Harnessed in and having fun! Now the fun part, proper gear! Usually adventure seekers LOVE gear (gear geek alert)! Having kids just means more fun gear research, seeking, and gathering. Yay! 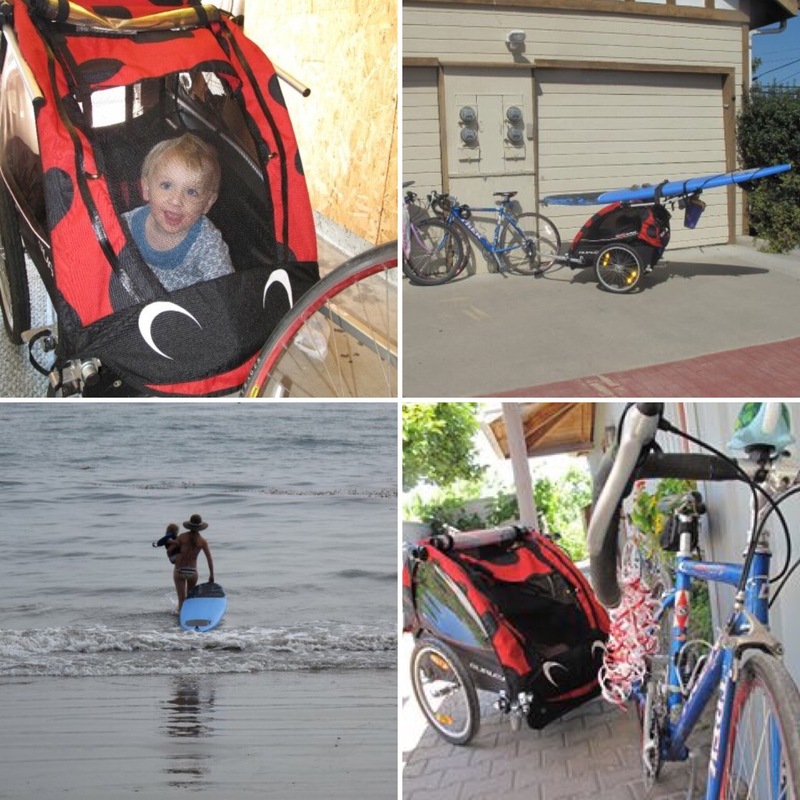 There are so many options for adventure gear which incorporates having the little tikes along with you. I will list a few items for some of our specific adventures. 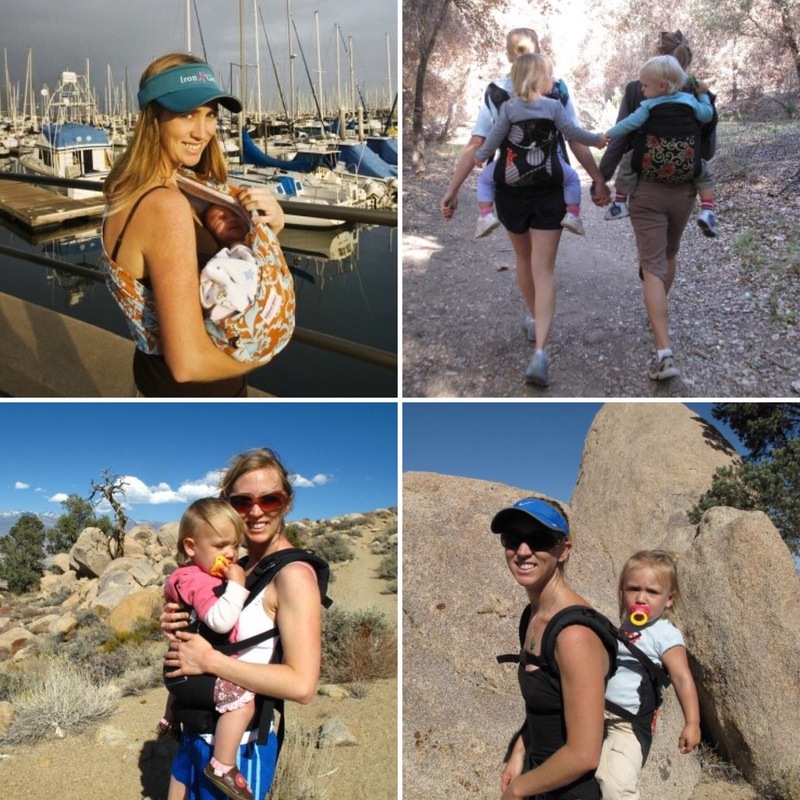 On the top of the list for gear is the need for a good baby carrier. The more portable and comfortable you and your children are, the more likely you will keep on keeping on with your adventures. 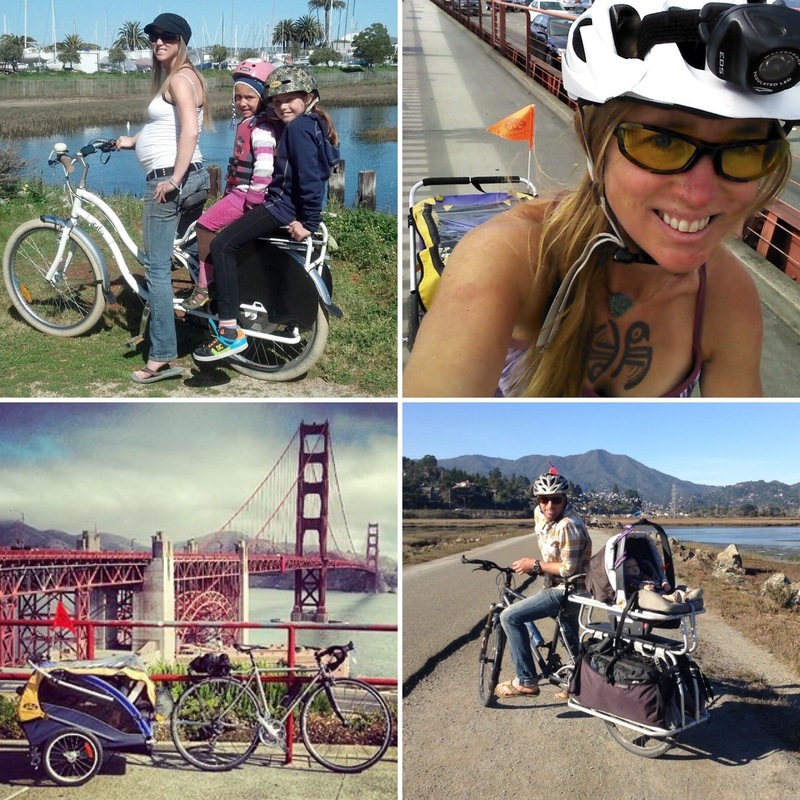 We used the Beco Baby (ergo like) the most, but there are many other options. Our friend makes her own, know as Obimama, that are handmade and quality. 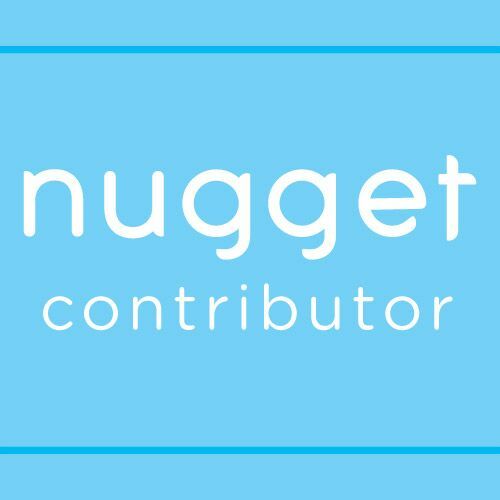 Here is a link to a good guide to baby carriers site. I posted a picture at the bottom of the blog as well. Side note on baby wearing: the more you wear your baby the better balance and self awareness they gain, increasing the child’s chances of also becoming a skilled adventurer. 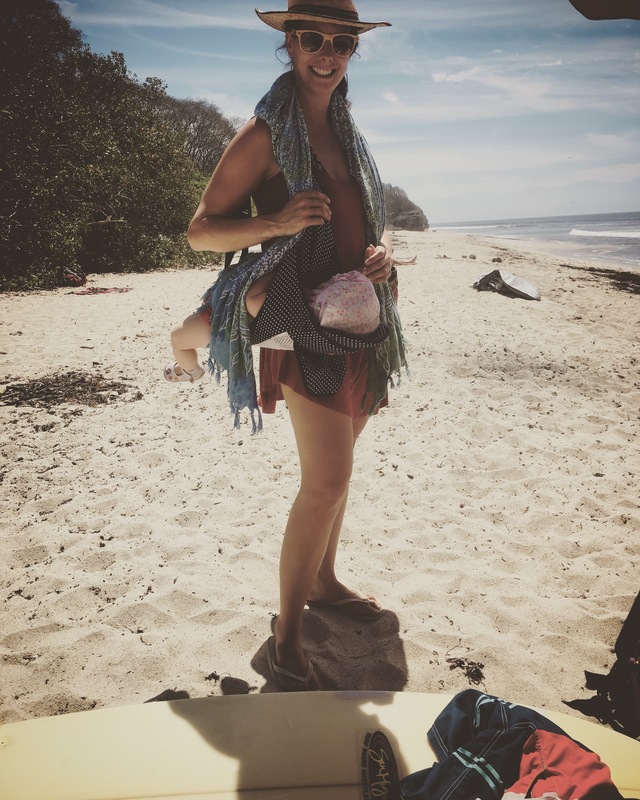 Our friend Natasha carries her 6 month old who’s sleeping to the surf beach in a carrier that converts to a reclining bed hung over the shoulder! Sling and beco baby = versatility and easy to pack in a bag. As your children get older they do more on their own, maybe slowly, but let them do it. Remember, patience will allow the adventures to continue. 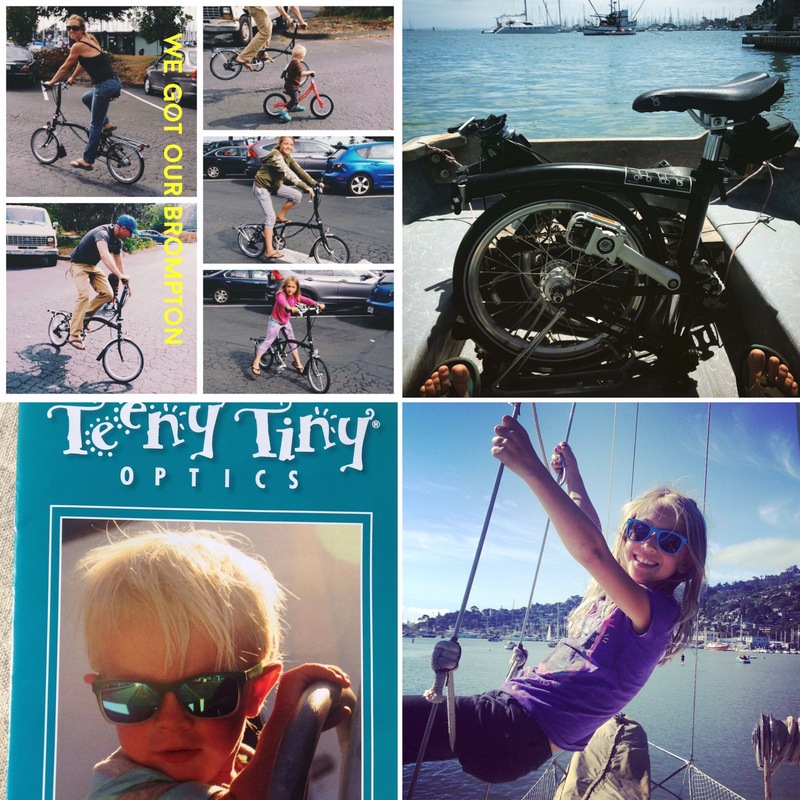 Some other gear we suggest: Brompton folding bike, Xtracycle cargo bike, Burley Bike trailer, also the Charriot and other joggers. The list can go on for a long time. Have fun researching ways to keep your active life going! I won’t ruin the fun of seeking your gear out. Personally we go budget style if possible. Up-cycled gear (hand-me-downs) are a favorite for us. Last but certainly not least, having a good support system around to help. Sometimes all you need is a few hours to go for a surf or swim or do yoga. “Back in the old days” we use to live in the same town we grew up in and family was around and readily available to help. This still happens now and again, but not nearly as it use to, so finding child care for a few hours or the day can be a challenge and can get really expensive. We suggest finding like minded friends with kids, or possibly no kids, that are willing to help support your adventurous lifestyle. We’ve met great friends on the beach to do a child watch surf swap. 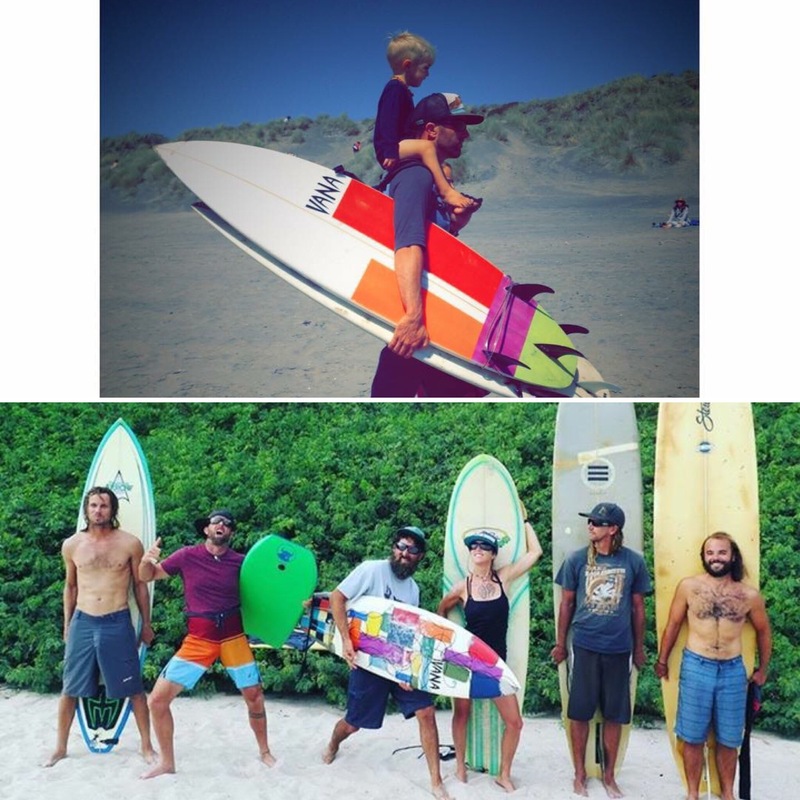 You watch my child while I surf, I’ll watch yours while you surf. Same for climbing. You might not be on a long multi-pitch climb, but taking turns on some smaller sport climbing routes works. All day peak bagging trips can be done as well. Remember that your mental health is just as important for your child as it is for you. Take the time for yourself and partner so that you are happy and your children will benefit as well. There are so many ways to think outside the box and continue on living a life of adventure while raising children too. Be adventurous, be unstoppable and have kids! 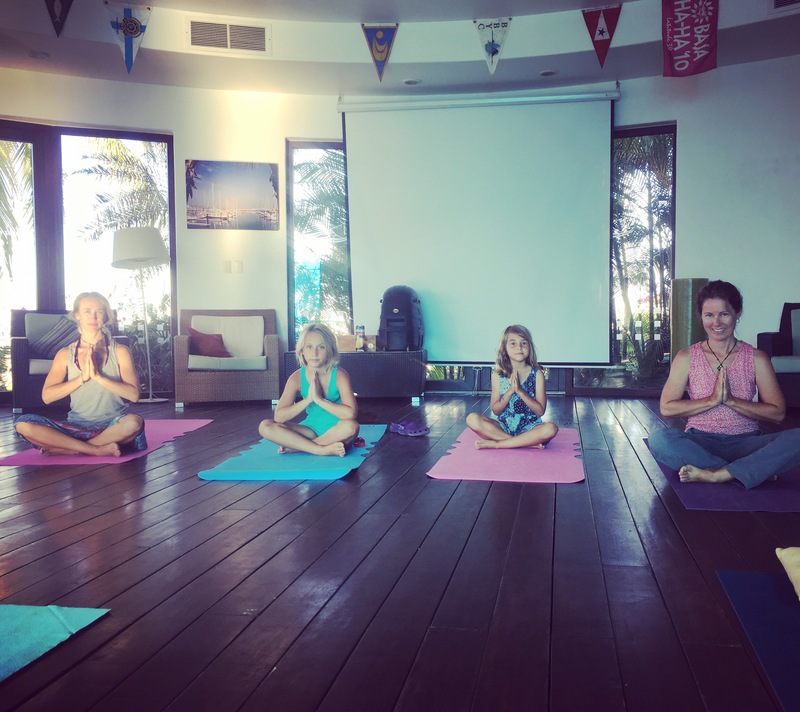 Mom and daughter yoga with another boat mom and daughter in the Marina La Cruz lounge. This entry was posted in Adventure, cruising with kids, Reviews, sailing family, Sailing with kids, World travel and tagged 10elite, a family afloat, active life, adventure life, adventures with kids, adventurous life, afamilyafloat, babies on bikes, baby carriers, baby sling, bike trailers, biking with kids, burley bike trailer, charriot bike trailer, child safety, cruising with kids, dont let kids stop you, gear geeks, good gear, hike, hiking with kids, keep on having fun, kid adventure, kid boat, kids on bikes, obimama, rock climbing, rock climbing with kids, safety, sailing family, sailing with kids, shawnigan, surf, surfing with kids, tip for adventures with kids, traveling with kids, ultimate guide to baby carriers, yoga with kids on April 16, 2017 by A Family Afloat.